Long standing Premier Cricket umpire Dan Bomford (above) will umpire his 600th Premier Cricket match in the opening round of the 2018/19 Victorian Premier Cricket season. The Sherrin’s are being packed away, the rollers are now operating in the middle of many ovals and the smell of new equipment, new balls and cut grass indicates one thing – a new Victorian Premier Cricket season is on the horizon again! A total of 9 new head coach appointments in Men’s Premier Cricket and 2 new head coaches in Women’s Premier Cricket will keep things interesting for the players at training, along with the numerous ‘fresh faces’ that will be taking over as Captain for respective sides this season. The opening weekend of Men’s Premier Cricket will see One Day matches commence at 10am due to Daylight Savings not in operation (this commences at 2am on the following day). The reigning premiers in Dandenong will commence their title defence on the road at Russell Lucas Oval against Ringwood, while fellow grand finalist Fitzroy Doncaster will be meeting Essendon at Windy Hill. Last season’s finalists Carlton and Footscray will face off at Mervyn G Hughes Oval, while other matches will be played at St Kilda (St Kilda vs Prahran for the RJ Parish Cup), Camberwell, Geelong, Kingston Hawthorn, Melbourne Uni and Casey-South Melbourne. The opening weekend of Women’s Premier Cricket commencing on Sunday will see the first matches as ‘full members’ of both Ringwood and Carlton-Brunswick in Women’s Premier 1st XI. Both clubs have been promoted over the off-season, boosting the competition from 6 to 8 clubs. Ringwood has previously participated in the 1st XI T20 competition over the last 2 seasons, while Carlton-Brunswick have been a powerhouse in the 2nd XI competition since they joined just 2 seasons ago. The Rams will host both grades at Ringwood against Prahran with the reciprocal action to occur in late November at Prahran, while the Strikers will host Dandenong on their 1st XI debut at Princes Park #1. Reigning Premiers Box Hill will commence the season hosting Melbourne at Schramms Reserve at Doncaster, while Plenty Valley will host Essendon Maribyrnong Park at Yarrambat. During the off-season, records have been collated identifying every umpire to have umpired a Victorian Premier Cricket 1st XI match, with a corresponding Cap number supplied to identify their place in the order of service. These are now available to view on the Victorian Premier Cricket website under History > Premier Cricket 1st XI Umpire Heritage Numbers (NOTE: This opens as a PDF in a new window). The PCMT thank Jason Leonard-Scott (Umpire & Coach Education Manager) for his energy and enthusiasm in collating these records and arranging applicable recognition items to those still. The opening weekend of Victorian Premier Cricket will also see 5 umpires reach major milestones for the season. Dan Bomford (Cap #248) will commence Round 1 by reaching his 600th match of Victorian Premier Cricket at the Albert Ground in the Melbourne vs Geelong 2nd XI match. Dan debuted as an umpire in the 1979/80 season, umpiring 327 x 1st XI, 216 x 2nd XI and 56 lower XI matches in that time. Dan has also been a valued mentor to umpires coming through the 2nd XI and the umpiring ranks. Graeme Lloyd (Cap #377) will umpire his 400th match at Schramms Reserve #2 in the 4th XI match between Fitzroy Doncaster and Essendon. Graeme debuted 1992/93 and has umpired 1 x Premier 1st XI, 125 x 2nd XI, 45 x 3rd XI and 212 x 4th XI. Graeme has also been a long-standing 4th XI umpire mentor to those that are newly joined within the Premier umpiring ranks. Vince Borg (Cap #502) will umpire his 150th game this weekend at Harry Trott Oval for the St Kilda vs Prahran 1st XI match. 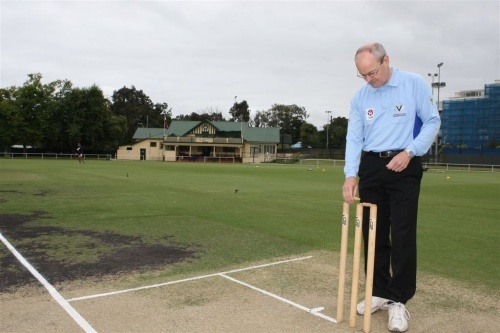 Vince started in season 2010/11, umpiring 75 1st XI matches in this time. Greg Azzopardi (Cap #537) and Jason Leonard-Scott (Cap #517) will both umpire their 100th games respectively at the Ringwood vs Dandenong 1st XI game at Russell Lucas Oval. Greg debuted in season 2013/14, standing in 33 1st XI matches during his time. Jason also debuted in season 2013/14 and has stood in 23 1st XI matches during his time.